Jean Claude Nkundwa, a 2014 graduate of Eastern Mennonite University’s Center for Justice and Peacebuilding (CJP), has been selected for the center’s Peacebuilder of the Year Award. Nkundwa has devoted himself to peace processes in his native Burundi. 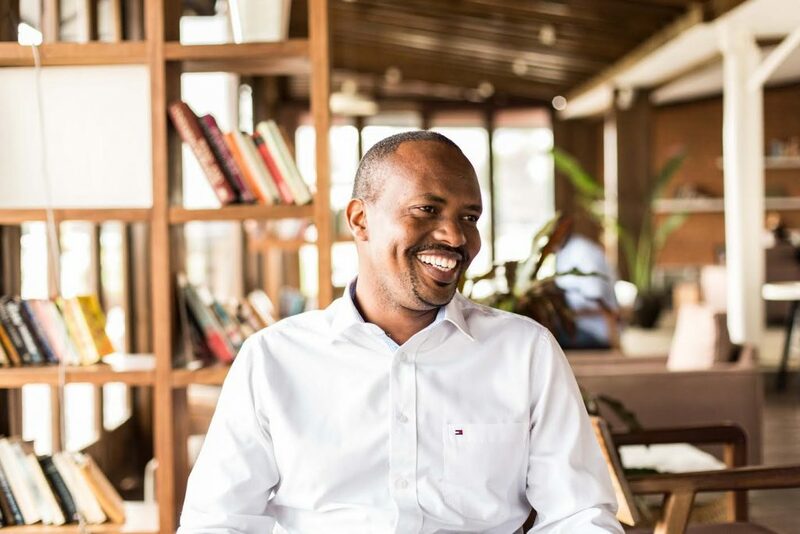 Since May 2015, he has been living in exile in Rwanda while advocating for sustainable peace and human rights in Burundi. The CJP Peacebuilder of the Year Award, formerly known as the Alumni Award for Outstanding Service, is given annually “to CJP alumni who have demonstrated exceptional commitment to CJP’s mission of supporting conflict transformation, restorative justice, trauma healing, development, organizational leadership and peacebuilding efforts at all levels of society,” according to CJP Executive Director Daryl Byler. Read more about Jean Claude Nkundwa’s work in Peacebuilder magazine. The award honors Nkundwa’s “creative and courageous peacebuilding work that combines grassroots education and networking, trans-Africa coalition-building, engagement with multiple stakeholders, effective use of the media, and strategic advocacy at the United Nations and in Washington D.C.,” said Byler. Nkundwa’s independent work, as well as his collaborative and strategic skills, have clearly made an impact. After returning from a frustrating advocacy trip to the United States last summer, he decided more strategic planning and cohesion was needed to effectively tell the story of what was happening in Burundi. In the fall, Nkundwa invited fellow African peacebuilders and organizational experts to a comprehensive strategic planning that resulted in a formal organization called “Burundi Citizen Synergy.” The organization joins various movements, media leaders and labor union leaders, among other groups, “to build a stronger network of joint advocacy and communication strategies,” said Nkundwa. After the planning process, he was elected by the board to a two-year term as executive secretary. His current task is to develop an annual action plan, mobilize partners and resources, and secure funding. He plans two speaking tours to the United States, one in mid-March and a second this summer when he will come to EMU to accept the award. Nkundwa will be honored during a luncheon event at this summer’s Summer Peacebuilding Institute. The award comes with a transportation grant to attend one SPI course. The first award was conferred in 2015 to Ali Gohar, MA ’02, founder and executive director of Just Peace Initiatives in Pakistan. Last year’s recipient was Tammy Krause, MA ’99, an expert in restorative justice. All of the 590 alumni who have earned master’s degrees or graduate certificates in conflict transformation from CJP are eligible. To nominate an alumnus for the Peacebuilder of the Year award, email cjp@emu.edu. Congratulations Jean Claude. Big up, as said Julius Aurelius, what we do now counts for eternity. Your current passionate work will produce positive impact sooner or later, keep it up brother. Congratulations JC. We can’t thank you enough for your efforts, dedication for peace, your inclusive approach and honesty in your ideal. This award comes in the right time when number of activists have started experiencing a sense of hopelessness in front of Burundian leadership that only understands his only language, defiance and stubbornness. My congratulations to my brother Claude NKUNDWA for the efforts and contributions to the conflicts solutions in Burundi. He dares to give sacrifice even if there are many risks to his life according to the situation in our country! He didn’t hesitate to continue his fight for peace restoration. The country needs the youth like Claude! With many young people who will take the examples of Claude, I do not have doubts that Burundi and other countries in the world will convert peaceably. Go ahead Claude! My dream is to do that institute also!